The origins of Slovakia's oldest exposition of folk architecture were efforts of Eastern Slovak museum employees. Already in the 1920s, to build a skanzen in this important centuries old spa, where the disappearing relics of the folk architecture of northeastern Slovakia could be saved. Transfer of the church from Mikulasova in 1926-32 was the first accomplishment in this effort. Though they could not master enough resources to continue saving architectural relics, the idea survived, and finally at the end of the 1950's matured to concrete projects. The aim, besides the protection and preservation of folk architecture, was also to increase the attraction of the spa for tourists; and establishing the connection of the spa and tourism with the presentation of rescued relics of folk architecture was an important contribution of visitors to this exposition, which rose on the margin of the valley between 1960 and '65. In the ensuing years other buildings were added. Among the conservationists who took part in the preparation and realization were the project's authors, Imrich Puskar and Blanka Puakarova; as well as Saris Museum employees A. Fricky, J. Mihal, T. Weisz and A. Koval; and a whole range of village carpenters, builders and farmers from the villages of Fricka. Bardejovska, Nova Ves, Zborov, and Dlha Luka. Thanks to the fact that the first exhibits were built by people experienced in timber construction, the first open-air museum in Slovakia grew quite quickly. The park-like method of presentation is influenced by the small area, and the limited possibilities of activity in a zone for preservation of mineral waters. The exhibition of the folk architecture of upper Saris and northern Zemplin includes a rare technical relic from Bardjov, a borer for wooden water pipes. 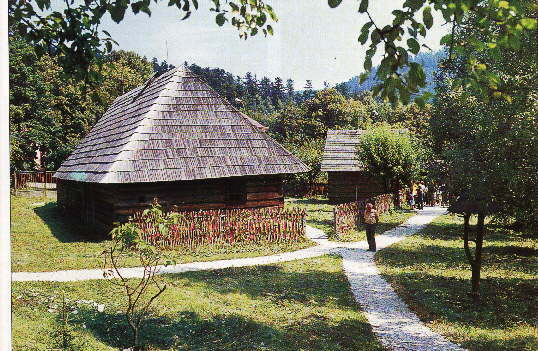 Original houses and outbuildings as well as sacred buildings and small architecture, transferred here from different parts of northeastern Slovakia, demonstrate widespread variants of timber structures as well as pile construction. The most characteristic element of folk structures of this region is the same proportion of roof material to wall material. This portion is slightly different from the neighboring regions of Spis and Sub-Carpathian Ukraine, south Zemplin and Abov, and the northern and southern parts of Poland. The proportion of the roof to the walls is given by the horizontal division of the building as well as by the spread angle of the roof slope, which was influenced by roofing material. The location of buildings from different parts of the area together in the Museum makes this feature obvious. The largest part is devoted to the characteristic three-room house. (main chamber, parlor and storage room) with subsequent addition of outbuildings (stable, barnyard sheds). This type of house is represented in the museum by a building from Kraculnovce (not far from Giraltovce), characteristic for the Topla River basin. In most villages, the inner as well as outer walls were daubed with clay and blue-wash. Decorated in the same way is a three-room house from Hrabova Roztoka by Humenne, which does not have a chimney, so, smoke from the ovens rises freely to the ceiling space. The attic was used for storing the house production of corn, in chests and corn baskets daubed with clay. First from the best quality wood the living space was built and from the wood of lesser quality, under a common roof, other out-spaces were added: storage room, stable, barn and wagon house. This continuous method of building is demonstrated in an unfinished house from Mal'covo, west from Bardejov. The space for the storage room was made by the temporary division of the parlor - though building did not continue, and at this stage the structure was transferred to the museum. It has a ridge roof with plank gable & barge-board, thatched. The furnishing of the interior is original and shows life from the mid 20th century. Houses in Saris were built on a high stone underpinning, and the interior was sprinkled with gravel and sand, and surfaced with clay scrabble- true of all living areas as well as of the barn. This floor is also characteristic of the widespread Lemkov type, demonstrated in the park by the house of a farmer from Petrova, near Bardejov. Houses in most of the Ruthenian villages had a storage room placed next to the main chamber. Storage rooms placed like this also have more simple variants in the same type or house from Fricka and Hutka. The pecularity of the houst from Petrova is the narrow timber space (priculok) built along the storage room, which protected the timber house against snow drifts, and the melting from warmth coming from the storage room. Such spaces were built mostly in the valleys opening to the north. Houses around Giraltovce also have this space but constructed of wickerwork, and called a pletar or piletar. For better insulation, chaff was stored during the winter, as well as Ietnina, leaves on twigs, which at the end of the winter fed the cattle. 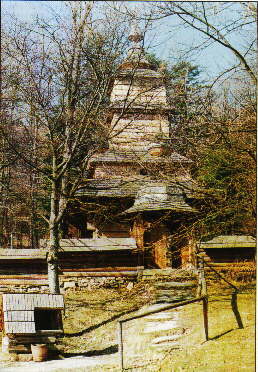 A combination of both types covers the side and back wall of the house from Hutja, which is far outside the sightseeing circle-like the belfry of 1700 from Janovce, the house from Richvald, and the Bardejov timber house with carriage-way, which are in the unfinished second part of the museum above the road. Most interesting are the structures of the wooden timber churches, or cerkva. Outside the opened part of the area is the church from Niklova-Mikulasova, near Bardejov, already referred to, from 1730. It belongs to the group of Lemkov churches with expressive front tower divided into a Baroque, so-called Wallachian cap with polychrome cornices, a balustrade, and painted clock, symbolically showing half past eleven. The church is dedicated to St. Nicolas the Bishop. Dominating the interior is a Baroque iconostasis ornamented with rich gilded carving of grape tendrils and fruit. A second church or cerkev is also devoted to St. Nicolas, and is from the village of Zboj in the easternmost valley of northeastern Slovakia, on the Ukraine and Polish borders. This little church, also with, a very expressive tower, belongs structurally to the Boykov type. It was built in Zboj in 1706, and after 260 years was transferred to the Museum in Bardejov Spa. The whole structure is made of beams 52-58 by 12 centimeters. The fundamental base of the pile-construction tower rests on a timber choir above the entrance. All three spaces in the church are joined together and are constructed of timber. The nave has several levels, and each level has a corresponding roof, which spreads and graduates the material of the roof as well as of the whole structure. The original Baroque iconostasis has been restored from damage during a theft in 1933. 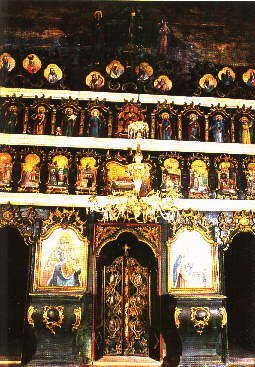 It is the only original Rococo iconostasis in complete form in Slovakia. Another interesting structure is a little belfry-gate to the church area, which was transferred to the Museum from the Ruthenian village of Nizny Orlik in upper Saris. It was built sometime between the late 1680s and the early 1700s. Proof of this is the Gothic binding of supporting piles, which creates an interesting portal from both sides. There is also a beautiful spherical roof on an octagonal base, wooden ribbed lantern, and onion dome forming the tower, with a good iron-plated cross. The little belfry from Nemcovice is of the most widespread type of belfry in the environs of Bardejov, where they were built in villages which did not have church. In Nemcovce it stood in the middle of the village and served the great estate as well as the farmers. Today the most commonly preserved buildings from the collection of folk architecture in upper Saris are granaries or sipance. They stored cereals, which during storage were turned with wooden shovels so as not to become musty. In granaries smoked meat was also stored, the more valuable tools, festive dress, woven textiles, important papers and money. The granary's construction and location had to protect valuables against fire, ground and atmospheric humidity, and rain and sun. Archaic timber construction, an airy base, daubing with clay, double-plated doors and triple locks secured these conditions. All variations of this archaic type of building preserved in upper Saris are in the museum. One can also find here a half-smoked timber drying-shed for fruit, from Buclovany, near Bardejov, and timber forge from Abrahamovce. 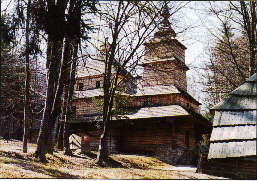 Among the technical structures at the Ethnopark (though non-functioning) is also a fulling-mill or folus from Livov, west of Bardejov. It is only a reconstruction, because the original was in very bad condition. Basic parts of the interior, however, are authentic elements, which were used in the Livov mill by the miller Skripek. Slovakia's earliest exhibition of traditional buildings has been showing its visitors the values of folk architecture of the country's northwestern part since the summer season of 1965. Gradually its curators have managed to install all spaces and buildings to the form that documents a particular era in the development of housing in this region, in the development of its life and architecture. 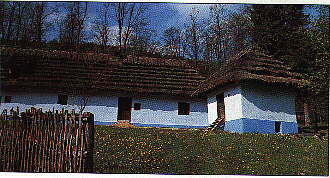 Buildings in the open-air museum are a permanent source for learning about the crafts, skills, and aesthetic feelings of the inhabitants of this part of Slovakia; as well as for providing a sense for simple beauty; and an inspiration for creating an aesthetic environment in the dwellings of people today.